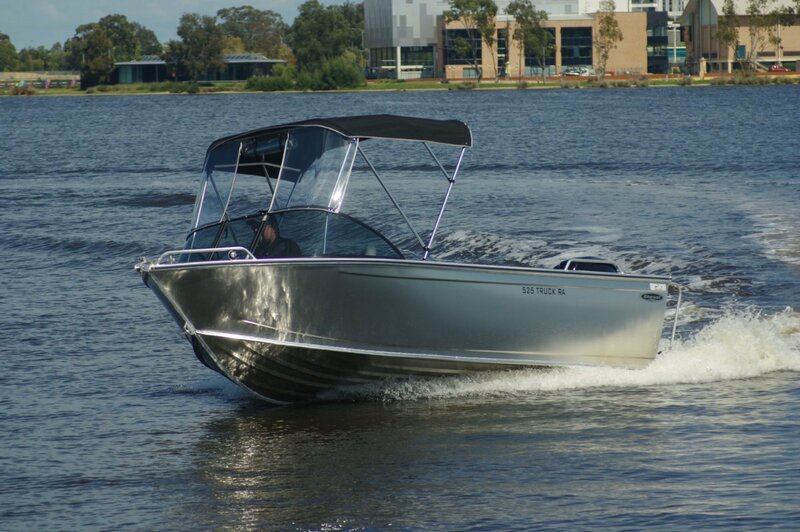 Like all the other Stessls I have come across the 525 Seatruck runabout features a basic simplicity combined with strong construction and thoughtful detail. Unpainted, as many Stessls are, the combination makes a roomy fuss free inshore fishing boat. The foredeck is very short, maximizing cockpit space and minimizing under deck stowage; a pound board is in place to retain any gear put there. 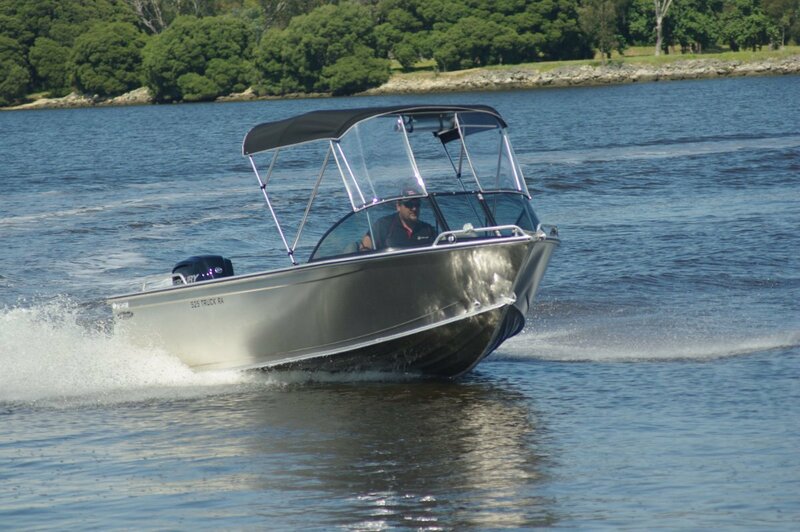 The short foredeck also puts the driver well forward. 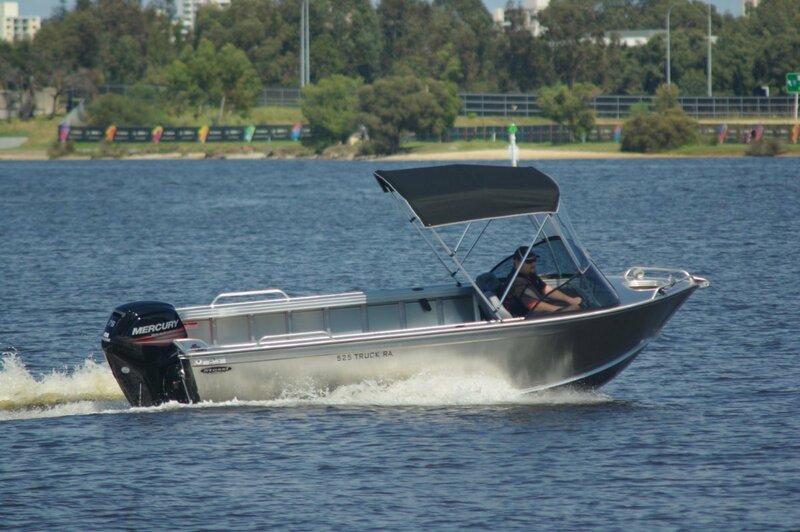 This can have a couple of effects: in choppy water he or she is at the point of maximum motion, so can have a rougher ride especially with a passenger up there as well. The cure of course is to slow down. The second effect, especially with no weight down aft, is more subtle. At the bow the bottom has a steeper deadrise. In a sharp turn at speed the boat can plane on this part of the bottom, digging the bow in and generally terrifying the occupants. The good news is that we found no such effect with the 525. The seating arrangements are sensible. The 525 comes as standard with a pair of pedestal seats fitting into sockets. There are two more sockets aft, so a passenger can elect to move down there, or the owner can buy a couple more seats if extra passengers are regularly carried. This set up combined with the short foredeck gives a vast open space for this size of boat. The seats are fairly close to the deck – lowering the centre of gravity is always good – but a foot well keeps the knees appropriately bent. The navigator is equipped with a grab rail and a glove box (why do we call them that? Has anyone ever put gloves in them?) There are side grab rails aft for when seats migrate there. The centre windscreen panel opens to give access to the anchor well (aluminium rather than plastic). That abbreviated foredeck means no recess is needed to get the anchor handler close to the well. The anchor handling gear itself consists of a mini bowsprit and a cast cruciform bollard. 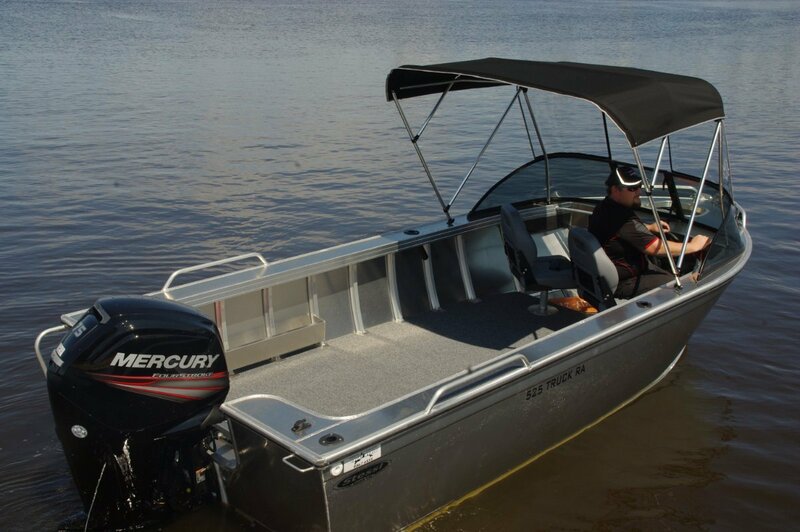 The Stessl comes standard with a fair sized Bimini and clears above the windscreen with an opening centre panel. There are zips on the Bimini’s sides to allow later fitting of clears there if wanted. Biminis are usually unwanted when actually fishing, and this one furls without fuss. The Stessl’s simplicity extends to provision of fishing equipment: four rod sockets are about it. But the more important fishing basics are well and truly present: room and stability. Not a lot of years ago aluminium boats could either perform well under way or at rest, but not both; then came ways of combining sharpness in the bottom with chines that sit under water when the engine goes quiet. The 525 has broad reverse chines that do the trick – something unusual in pressed aluminium. Its stability is very acceptable, allowing movement all over the carpeted deck with little movement from the hull. There is not much provision for stowing stuff. Apart from the small under deck space and the glove box there is just a pair of partial length side pockets. There are those who would rejoice in this: an encouragement to leave the junk at home. There is, however, room and to spare on the deck for genuinely useful stuff like eskies and, a personal favourite when travelling as a passenger, bean bags. Our 525 was fitted with a 75hp Mercury. Not really an overkill but certainly on the high side of adequate; coarse use of the throttle made take off explosive. Many people would probably be happy with 60hp or even less. On the other hand using all that power was irresistible, and we found the Stessl was great fun to throw around. It has no built in fuel tank, and the motor’s likely fuel consumption makes a portable tank a healthy choice: easy to drain and clean or to get rid of condensation.